Significant restructuring of the Maritime car-park in Paihia will cause disruption there between 20 August and 23 September. Council’s commercial trading and asset management firm Far North Holdings is changing the layout of the area to improve commercial vehicle flow, boost traffic safety and enhance pedestrian access to the wharf. The traffic island in the middle of the car park will be expanded to allow bus passengers to congregate there with luggage instead of blocking the footpath along the front of the Maritime Building. Two shelters will be added to the space and improved lighting will enhance safety and security at night, as well as the overall ambience of the area. Buses will park on the south (town) side of the traffic island while ‘authorised vehicle’ parallel parking along the northern (waterfront) side of the car-park will allow smaller shuttles to drop off and pick up along the building. This ‘authorised vehicle’ parking will convert to public parking in the evenings. Five new 30-minute public parking spots and a parking space for disabled drivers will be created to replace the six spots taken by the new bus parking area, and there will be three dedicated taxi parking spaces. There will be two ramp access points to the pavement for wheelchair users and those pushing prams. Dedicated goods vehicle parking spaces and loading zones will service the needs of local businesses and wharf users. 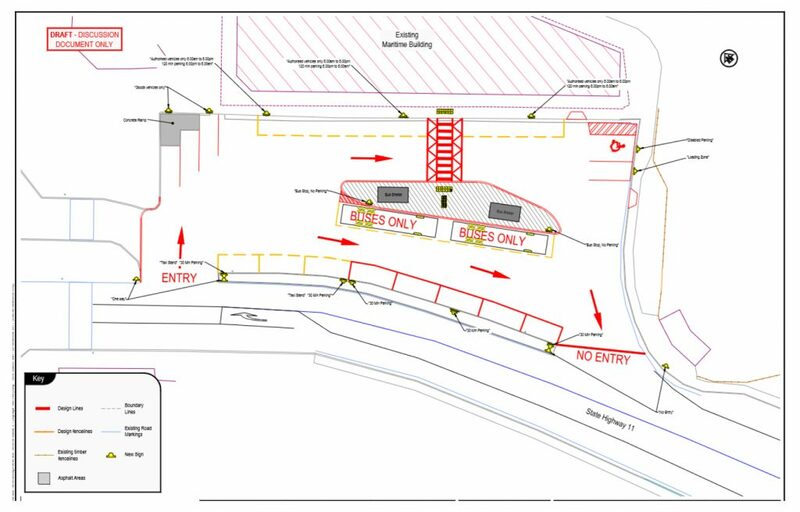 Those spaces closest to the foot of the wharf will be staggered to get rid of a pedestrian pinch-point currently impeding access. Signage will be installed in the area to direct drivers to the main Paihia car-park off Williams Road. Far North Holdings project manager David Penny apologised for the inconvenience that the construction will create. Drop-offs and pick-ups will still be possible but use of the car-park will be limited. He said it was something that had to be done. Traffic use in the car park had become “a bit of a free-for-all”, causing logistical problems for local businesses, tour operators, visitors and residents alike. “The challenge has been to meet the needs of a wide variety of businesses and people within the confines of the existing space,” said Mr Penny. Separately, Far North Holdings will be resurfacing the Williams Road car-park. This will take place once work on the Maritime car-park is complete. It plans to realign the surface contours through the low centre-section of the carpark to ensure good water runoff from the area. Potholes and damage to the pavement surface will be repaired as part of this process.